Woodland Trail may be part of Shiawassee National Wildlife Refuge but it is literally on the edge of a city and Saginaw is lucky because of that. If there was ever a perfect escape from its urban grasp, this is it; a point of land where two great rivers converge to form a moat against the advances of what some people would call progress and others decay. On the north there's the Tittabawassee, on the south side the Shiawassee. In between the two is an area of woods, marshes, creeks and 5 miles of trails open to hikers, mountain bikers and cross-country skiers. The trail system is divided into three loops of various lengths that all begin from the same trailhead. 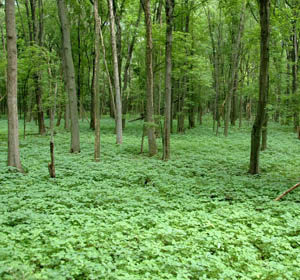 The Marsh Loop is the shortest, a mile-long loop in the woods. The River Loop is 2 miles and includes a half mile stretch that passes through a field along the bank of the Tittabawassee River. 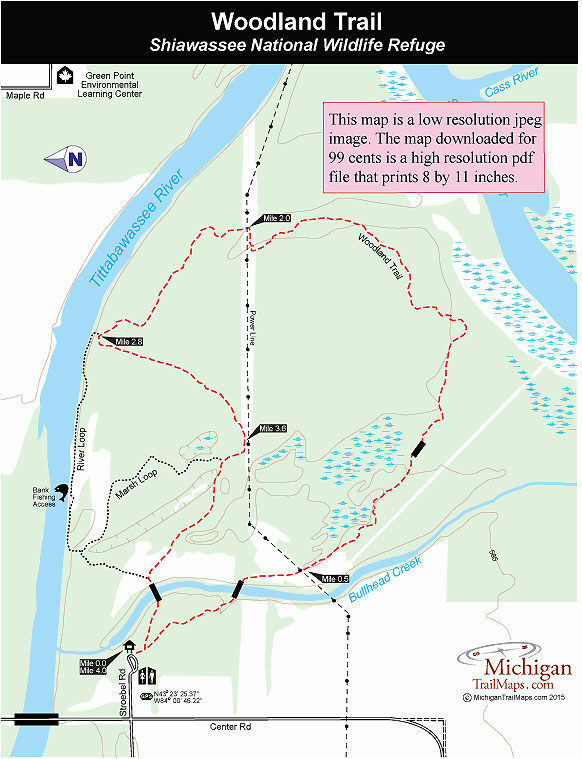 Woodland Trail is the longest loop at 4 miles and true to its name stays primarily in the bottomland forest with only a passing glimpse of the Tittabawassee River and none of the Shiawassee River. It would be easy to add the scenic stretch of the River Loop to the Woodland Trail. That would reduce the length of the route to 3.6 miles but in doing so you would miss one of the most interesting stretches of the Woodland Trail. What to do? Ride or hike them both for a 6-mile outing. Unlike the Ferguson Bayou Trail on the south side of the Shiawassee River, the Woodland Trail is a narrow primitive path rather than utilize a series of dikes. But overall the trails are level and easy and surprisingly dry considering the swamps and ponds they pass. They are ideal for beginner mountain bikers and are popular in the winter with cross-country skiers when there is sufficient snowfall. Keep in mind that this area is a floodplain prone to excessive seasonal flooding and wetness, particularly in the spring. The bugs can also be thick here in early summer. To reach the trail depart I-75 at exit 149 and head west on M-46 for almost 7 miles, crossing the Saginaw River along the way. Turn south (left) on Center Road and in 1.7 miles you’ll cross the Tittabawassee River and then see a sign for the refuge trail on the east side of the road. The parking lot and trailhead is just off Center Road. From the trailhead a mowed lane departs south into a field past a picnic shelter and underneath a power line before coming to the crossover spur in less than a quarter mile. The main loop continues south and enters an upland forest of beech, maple and other hardwood trees while staying within sight of I-75. At one point you swing near a small marshy pond where a few heron nests sit high up in a dead tree. You can even quietly observe the nests from the trail if the bugs are not too bad. Within a half mile you arrive at a low bluff above the Cass River where the muddy river bank below is often covered with deer tracks. This spot is also a fishing access site for bank anglers. Beyond here the trail becomes much narrow as it wings west to skirt the Cass River for a quarter mile. Eventually you swing north and return to the upland forest before reaching the crossover spur a second time at Mile 1. The power line is passed underneath again and the trail arrives at a pair of maintenance buildings where you head right on the entrance drive to quickly reach the trailhead parking area. Most trailheads feature parking areas, informational signs and restrooms. There are interpretive displays and information at the refuge headquarters on the Curtis Road. Green Point Environmental Learning Center serves as the visitor center for the Shiawassee National Wildlife Refuge and has natural history displays, an observation area for birds and other wildlife and naturalist programs throughout the year. Trails are open year round, seven days a week, during daylight hours only. During October and November trails may be closed for visitors' safety during hunting periods. Green Point Environmental Learning Center is usually open 8 a.m. to 4 p.m. Monday through Friday when staff is available and the refuge headquarters is open 7:30 a.m. to 4 p.m. Monday through Friday. The newly completed in 2013 Shiawassee Auto Tour is open June through September from sunrise to sunset and then from 1pm to sunset until October 25th. From I-75, depart at exit 149 and head west on M-46 for 2 miles. After crossing the Tittabawassee River head south on Michigan Avenue and then turn left onto Maple Street. After passing a gold course, Maple Street swings west as Gabriel Road and the entrance to Green Point Environmental Learning Center is immediately reached. For more information contact the Green Point Environmental Learning Center (989-759-1669) or the Refuge's website at http://www.fws.gov/refuge/Shiawassee.